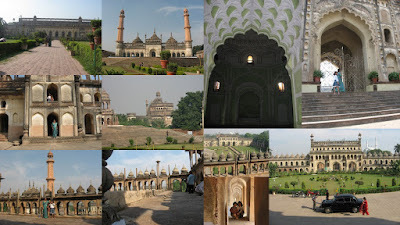 We were at the Bada Imambara at Lucknow. Amazing building and amazing people behind the building. Why would some one want to build such a majestic structure? Add to that the Bul Bulaiya, that is the maze which runs through the walls and pillars, and runs through 3 levels. The guide tells us there are 1000 ways within the maze,but only 1 way is the right one to get us out of it! It appears that man will do anything for posterity and this is definitely an example of that. You and I can enjoy the quirks of the moneyed class as they leave behind monuments and minarets for future generations to explore and savor. This building brings to my mind the innumerable photos of SRK's palatial house Mannat floating around the cyber world. Then there is even our own favorite batsman's new pad...with foyer designed like the interior of a conch shell!! It's true, google around and you will find it. And what about Ambani tower? Kids enjoyed the Bul Bullaiya a lot, and finally the guide made my son act as the guide to find out the correct route. Of course we got lost and he had to help us out! My Mom shares my fascination for such adventures through lands and landmarks. It was great fun, 3 generations exploring that fantastic space, each one carrying away different thoughts and feelings. Nice post. Good to know that your kids had a wonderful time in the Bhool Bullaiya maze.